First you have to connect your Google Drive account with Auphonic: go to our services page and click the GoogleDrive button. Then you will be redirect to Google and have to accept that Auphonic can access your Google Drive. 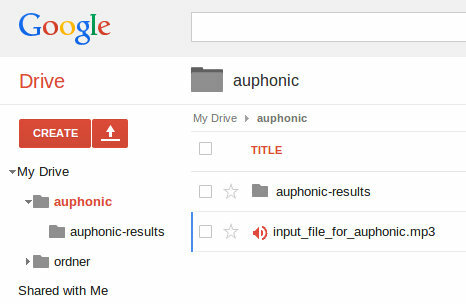 To process files with Auphonic (incoming file transfers), you must put them into the folder 'auphonic' in your Google Drive. All compatible media files in this folder will be listed in Auphonic when creating a new production. Files exported from Auphonic to Google Drive (outgoing file transfers) will be put into the folder 'auphonic/auphonic-results'. Auphonic folders for incoming and outgoing file transfers. It's now also possible to use Google Drive in our API and Mobile App for iOS/Android. If you want to use Google Cloud Storage, please read this blog post!